I was given an ARC of this book in exchange for an honest review. covers everything from steampunk and fantasy to sci-fi and horror. It’s a cross-genre smorgasbord that’s sure to hit the right spot, with a dose or two of straight-up genre fiction for the meat-and-taters appetite. I don’t even know where to start with this book. I just loved it. Loved it with a capital L. I can’t even put my finger on why I loved this so much (which is not the best thing for a reviewer to say, but it’s the truth). Here’s what I can attribute my adoration for this book to: 1) I love short stories, and you get 13 of them in here. 2) I love eclectic storytellers, at least that’s what I call them. The author calls himself a cross-genre author. That works for me too. I just love when an author can put on many different genre hats and no matter what, they still work. Their voice is still clear regardless of settings. 3) There aren’t many steampunk stories out in the market place and even fewer that are as devout to the genre without making it cheesy or campy or over commercialized. This author can do that, seemingly without effort. If I had to single out one aspect that justifies me giving this a top rating it would be Quincy Allen’s ability to describe the world you are reading about with such imagery, so vividly that you can taste it. The settings jump off the page in a color scheme of electric blues, grays, yellows and everything in between. The darkness is just perfect when it needs to be. Nothing is taken away from in these stories. 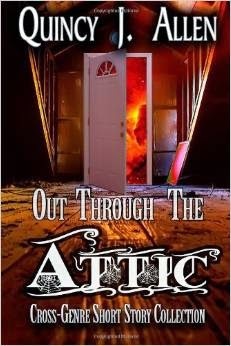 I know that this type of book, short stories that are from multiple genres aren’t going to be everyone’s cup of tea, but if you enjoy stepping out of the box and reading something a bit different than pick up Out Through The Attic by Quincy J. Allen. It is a great read. About The Author: Quincy Allen, is a self-proclaimed cross-genre author. What that really means is that he’s got enough ADHD to not stick with any single genre and, like his cooking, prefers to mix and match to suit his tastes of the day. He has been published in multiple anthologies, online and print magazines as well as one omnibus. He’s written for the Internet radio show RadioSteam. His novel Chemical Burn—a finalist in the Rocky Mountain Writers Association Colorado Gold Writing Contest—was first published in June of 2012 and is due out in 2014 in a newly revamped edition from Word Fire Press, which will be carrying the Justin Case series. His new novel Jake Lasater: Blood Curse, is also due out this year as well as a military sci-fi novel from Twisted Core Press. He works part-time as a tech-writer to pay his bills, does book design and eBook conversions for Word Fire Press by night, and lives in a lovely house that he considers his very own sanctuary.